Back in August, a number of Microsoft employees were gifted an exclusive white and silver Xbox One as the company’s way of saying “thanks” for the hard work they put into the project. Now it appears that some lucky recipients are looking to make a quick buck from the gift as no less than 10 of these rare consoles recently surfaced on eBay. The standard employee bundle includes a white controller stamped with the phrase “I Made This,” a black Kinect sensor and a year’s subscription to Xbox Live. The white console, meanwhile, also features the aforementioned phrase along with the text “LAUNCH TEAM 2013” and a 500GB hard drive. As the auctions proclaim, there’s currently no rarer Xbox One than these which is reflected in the pricing. A quick check of the auction site reveals the cheapest “Buy it Not” price is $1,800 – well over three times that it’d cost to purchase a standard console. The most expensive auction currently commands nearly $3,600. Many of the auctions also include Day One edition launch titles including Dead Rising 3, Forza 5 and Ryse: Son of Rome. 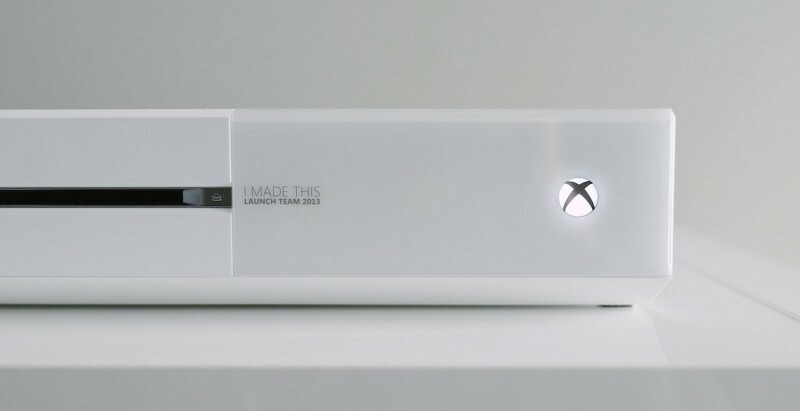 Those looking for a white Xbox One sans “I Made This” branding may get their wish later this year. Back in January, sources said Microsoft was planning to launch a white version of the console in October. What’s more, an Xbox One with a 1TB hard drive is reportedly planned for November.